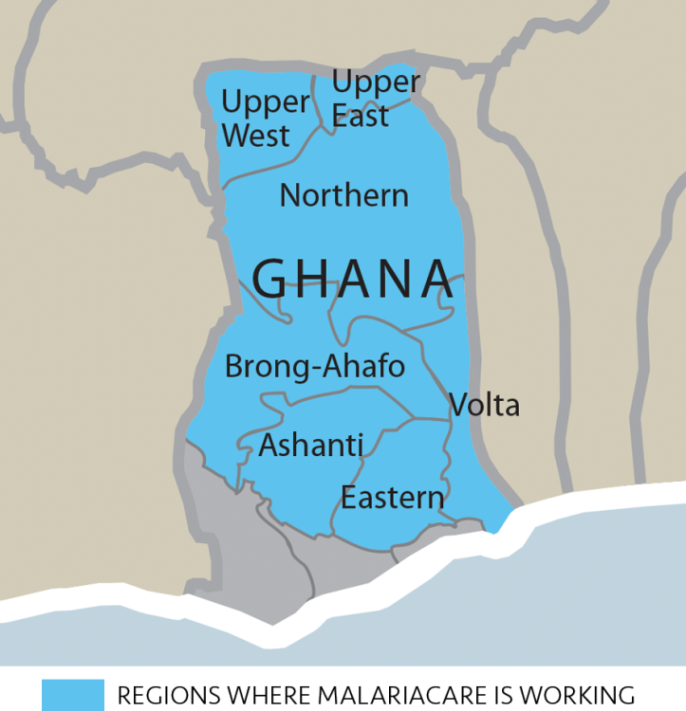 In Ghana, MalariaCare is working in seven regions to improve malaria case management across the continuum of care—from communities to health facilities—and in both the public and private sectors. The project collaborates with the National Malaria Control Program and other partners to build case management capacity at all levels of the health system. Key activities include strengthening quality assurance (QA) and quality improvement systems and supporting routine systems for malaria monitoring and evaluation. According to Ghana Health Service health facility data, malaria is the number one cause of morbidity and mortality in children under five years of age, accounting for 33 percent of hospital deaths, 38 percent of all outpatient illnesses, and 36 percent of all admissions. Early, accurate diagnosis and rapid treatment with a recommended antimalarial drug combination is a key component of malaria control efforts. Recently, malaria control activities in Ghana have improved, but progress toward increasing access to universal malaria diagnostic testing and appropriate treatment has been slower than other interventions. Key challenges include limited access to skilled care in rural areas, poor compliance with case management guidelines among providers, and inconsistent access to rapid diagnostic tests (RDTs) and high-quality artemisinin-based combination therapies for malaria treatment. Because public and private health facilities reach only about 60 percent of the population, there has been a recent push to expand malaria case management activities at the community level. However, scale-up of integrated community case management to rural areas has been slow,and a large proportion of children in marginalized areas still do not have access to basic health care. Scale up and improve access to and availability of high-quality malaria diagnostic services and treatment with a focus on lower-level health facilities. Improve the accuracy, reliability, and availability of health information management systems. Strengthen technical management ability for implementing programs and activities at the regional level. Strengthening malaria diagnostics. Activities include supporting Ghana’s clinical laboratory QA program and conducting training and supportive supervision for laboratory technicians and microscopists across the country. MalariaCare is also working to increase the availability and appropriate use of RDTs in health facilities and communities. Improving clinical care of malaria. To improve care for malaria patients, MalariaCare is supporting Ghana’s Institutional Care Division to conduct clinical training and supportive supervision for health providers in seven regions. The partnership is also working to incorporate new malaria case management guidelines into pre-service curricula and supporting the development of a national policy and guidelines for clinical supportive supervision. Piloting malaria case management at private pharmacies. To reach the high percentage of patients seeking care for fevers at local pharmacies, MalariaCare is testing the feasibility of training pharmacists to provide malaria case management services. Promoting provider adherence to test results. Some health workers in Ghana still provide malaria treatment for fevers even when test results are negative for malaria. To improve appropriate treatment based on test results, the project is collaborating with partners to develop a range of strategic policy, advocacy, and communications activities. Supporting integrated community case management. The project is training community-based agents to provide community case management of malaria and other illnesses. Supporting health information management systems. MalariaCare is conducting outreach training and supportive supervision to improve the data management capacity of health information officers in seven regions. The project is also facilitating the development of a decentralization strategy and a national data quality assessment plan. Building technical management capacity of malaria programs. Activities include assisting seven regional health management teams to create evidence-based, region- and district-specific plans for supervision, training, and implementation of malaria programs. Enyiresi Hospital’s successful transition to a test and treat approach is an inspiring model for health managers in Ghana. During a planning meeting in the Upper West Region, MalariaCare highlighted the hospital’s success. Using group problem-solving coupled with effective training, hospital staff switched from presumptive diagnosis to treating patients based on malaria test results. Encouraged by this success, each district in the Upper West Region committed to reducing presumptive treatment for malaria by 50 percent.